I took a trip to India last week with some friends and was just so inspired by the architecture of the major monuments. The stone on some of the buildings, while they are ancient, seemed so modern to me. 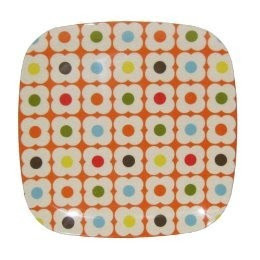 For instance, doesn't the above remind you of the prints used in the Orla Kiely Home Collection for Target? Here are plates from the British designer's line. Magazine Files As Bag Storage? Who Knew?